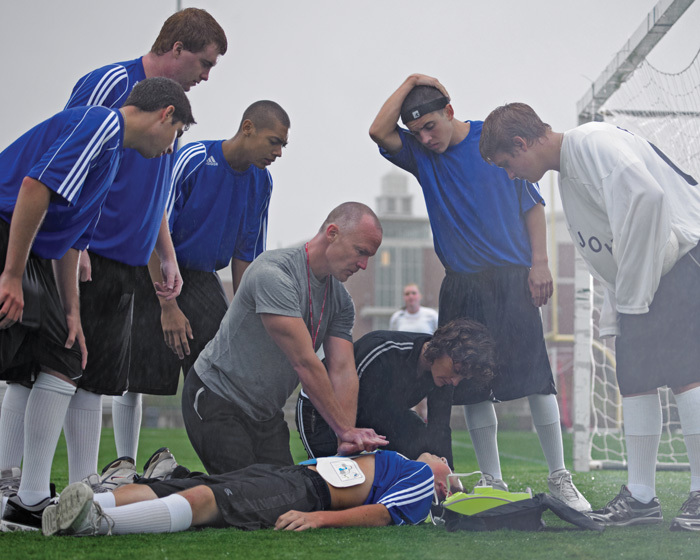 Home › First Aid › Do Sports Teams Need Defibrillators? Do Sports Teams Need Defibrillators? Given this, the advantages of having a defibrillator nearby are clear: for a cardiac arrest victim, it can make the difference between life and death. What does this have to do with sports first aid? It is not a stupid question. After all, heart conditions tend to afflict older people and the demographic for sportspeople is generally quite young. However, remember that the strenuous physical activity involved in sport does place a strain on the heart. While for most healthy people this is not a problem, a small number of sportspeople will have an undiagnosed heart condition of which they remain unaware until something happens. In fact, apart from direct injuries incurred during play, the most common cause of death in young sportspeople is some kind of cardiac event. In many of these cases, early defibrillation would have saved their lives. What does an automated external defibrillator do? An automated external defibrillator (the AED) is a kind of defibrillator designed for public use. It requires no special training or medical knowledge to operate. Its purpose is to deliver an electric shock to the heart to force it out of the irregular and uncordinated rhythm (called fibrillation) that causes cardiac arrest. It doesn’t restart the heart, as is sometimes shown on TV. In fact, it does the opposite – the shock stops the heart so it can restart in a normal rhythm. When you attach an automated external defibrillator to a patient, the AED will speak out loud and tell you what to do. You will usually need to perform chest compressions according to the AED’s instructions. In about 50% of cases the AED will need to deliver a shock to the patient. The AED analyses the patient and makes these decisions. The rescuser just has to follow the prompts. Which automated external defibrillator should I buy? Zoll AED Plus. A defibrillator we’re happy to recommend to sports clubs and venues. Like all AEDs, the Zoll speaks out loud to tell the rescuer what to do, but it can also monitor in real time the quality of the CPR being provided. If, for instance, the chest compressions aren’t deep enough it will say ‘push harder’ and even provides visual feedback to help the rescuer get it right. It is the only defibrillator that can do this. Zoll have recently produced clinical evidence suggesting that it can more double survival rates for out of hospital cardiac arrest. Lifepak CR Plus. The primary advantages of the Lifepak are its lower cost, and the fact that it is available in a fully automatic version. The fully-automatic version of the Lifepak CR Plus can deliver a shock without further intervention from the rescuer. (In the semi-automatic version the rescuer has to press a button to deliver the shock.) It doesn’t offer the same level of CPR help as the Zoll, but it remains easy to use and its simpler interface means it might be faster in the hands of a rescuer who has up-to-date training. Philips Heartstart HS1. The Heartstart HS1 is one of the best-selling defibrillators in the world. It is a very fast defibrillator because it features Philip’s QuickShock technology, which means it can analyse and deliver a shock within 8 seconds of the rescuer stopping chest compressions. It is also regarded as one of the easiest-to-use defibrillators available. You can see our full range of defibrillators and accessories by clicking here.